So, the final season of Dragon Ball Super introduced a ton of new characters, many of whom I took an instant liking to. Hopefully I can get around to drawing some of those others eventually, but for the time being I finally got around to Cocotte, here, the lone female Pride Trooper from Universe 11. My first thought when I saw her in her uniform was that it’d be fun to rip that uniform up, so that’s what I did! I didn’t really want to pair her with a specific character this time around, so she’s getting it from some random Pride Trooper (I’m not positive, but I assume there are other members than the ones we see in the tournament). I’m not sure if I’ll draw Cocotte again, I guess it’ll depend on how well she’s received in her debut. I think I’ve mentioned this before, but when I get Asks specifically referencing the Studio I tend to try and use them for a crossover pic (mostly ’cause I assume that’s why the asker would mention the studio in the first place). I went with Ryuko here for a few different reasons. One being this Patron has done Asks with her before, so I assume he’d like to see her again. Also, Ryuko’s one of the characters I identify more on the yuri side of the spectrum, plus she could probably relate to DMG’s situation for not getting selected for a lot of work in the Studio. Clementine was a close runner-up for this position, since she meets those same criteria, but I decided to keep it anime-on-anime this time around. 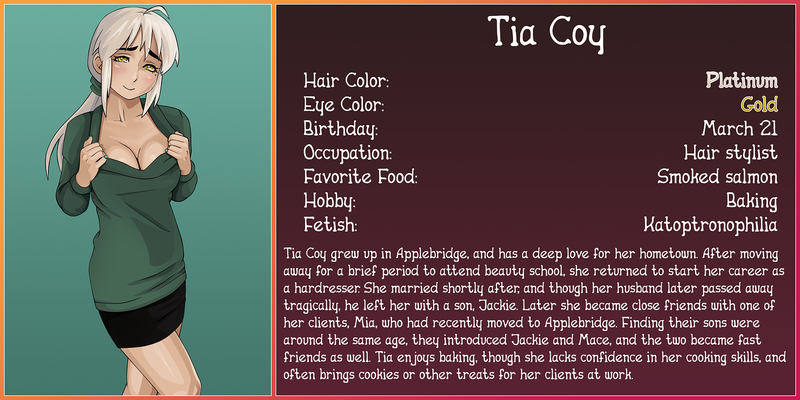 I decided I wanted to get bio pages out for Mace and Jackie’s moms, and I’m starting with Jackie’s. Sorry the pic to go along with this one is so tame, but I feel like I want to save both Tia and Mia’s “reveals” for a later date. Still, I hope you all enjoy the chance to learn a little more about the woman who raised Jackie. Sometime soon I’ll hopefully get to do Mia’s bio as well. So Lucien has appeared twice, once in a “canon” pic, and once in a commissioned pic. Between the two, I feel like the relationship between Lucien and Loren is portrayed a bit differently, hence Lucien’s bit of waffling early in his response. Like Lucien says here, though, I do think I’d like to show the fallout of his first appearance in a full Applebridge Snapshot comic at some point. Loren’s a gluttonous lad. I’ve always wanted to do more pics kinda like this, where a character’s just drowning in dicks. Does this sort of pic interest anyone? I might try and do more of them in the future, and they can be done with any gender to equal effect. So here’s another page of EcchiMask’s comic “Study Break”, for which I provided some colors. In the last page Gohan took his dad’s load in his face, and in this one Goku swoops him up to carry him off for more fun. ^_^ The next page is colored and added to the schedule, and should be released in a little over a month.